Federal’s Hydra-Shok line of ammunition is manufactured according to stringent processes and rigorously tested to perform reliably in self-defense situations. This 40 S&W cartridge has significantly less recoil than other comparable rounds, and also offers superb accuracy and overall ballistic performance. 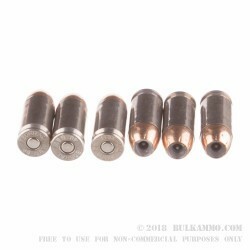 Its hollow point bullet’s notched copper jacket not only serves to initiate and control expansion, but also to facilitate penetration in as well as prevent the accumulation of lead residue in your pistol’s bore. The center post within the hollow point serves to even further promote expansion, even at lower velocities -- in conjunction with this round’s muzzle velocity of 1,200, you ought to always be in good shape. 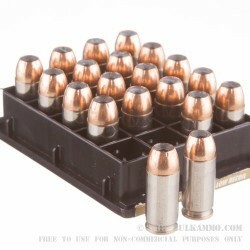 This cartridge also offers a non-corrosive Boxer primed factory fresh casing, so you may handload it for even more added value. Federal’s nearly 100 years in business has let them hone their manufacturing processes to a fine point -- you can always chamber their cartridges with confidence.